Every project begins with the right tool! 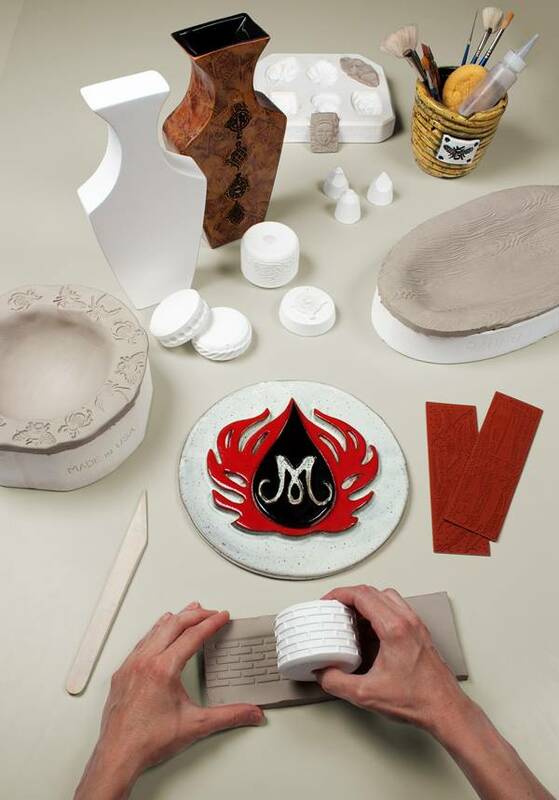 Add dimension, detail, and intricate design to your art work with Mayco decorating accessories, creating visual interest and personal expression. We have the basic tools you'll need for constructing with clay, a wide variety of brushes & writing bottles for glaze application, and many stamps, mats & silkscreens for surface decorating. Mayco Designer Silkscreens are a great way to add intricate detail to your work. Each screen is 15” x 12” with different themes (Sealife, Nautical, etc) or patterns (Chevron or stripes). Combine AC310 Silkscreen Medium with underglazes, Stroke & Coat® or Designer Liner to create a paste which is pushed through the screen onto bisque or unfired glaze surface. Designer Silkscreens can also be used with acrylics or fabric paint and can be applied to other craft surfaces. Add creativity and fun to your artwork with Mayco Designer Stencils. Easily create patterns by applying ceramic glazes, acrylics, textured paints, pastes or other decorating media on ceramic, fabric, glass, paper, wood and more. Based on the popularity of our Designer Stamps, we have developed a mat product for larger clay surfaces. These mats are 7” x 9”, made of the same material as our stamps for flexibility and ease of use. Like our stamps, our mats can also be used to apply glaze onto bisque ware. Magic Metallics™ are water-based acrylics that contain ground metal particles. When dry the surface will appear and feel like a metal surface. Magic Metallics™ can be applied to almost any paintable surface: glass, wood, fabric, Styrofoam, paper, ceramic, etc. Magic Metallics™ is NOT a faux painting process but an actual layering of metal particles on a craft surface. As the acrylics contain metal particles they can be made to oxidize - rust (steel) or patina gold, copper, dark bronze). Mayco’s glaze brushes are specifically designed to be used with ceramic glazes. They are a unique blend of Taklon for strength, durability and flexibility, with natural hairs that hold and evenly flow color. These brushes are principally designed for acrylic stains and contain boar bristle, ideal for dry-brushing and base coating.